Shipping is always free! Order now. This is probably not a question that we think about too often… but apparently we should! According to the Association for Pet Obesity Prevention (yes, that exists) an estimated 59% of cats are overweight or obese. Even more surprisingly, an estimated 15% of owners with overweight or obese cats believe their cat is a normal weight. Of course, we think our chubby kitties look adorable, but that extra couple of pounds could have a negative effect on their health. Since cats come in all shapes and sizes (and levels of fluffiness), your vet is your best resource for figuring out if your cat is overweight. So your vet told you your cat is overweight, now what? And why does it matter? Overweight and obese cats have a higher likelihood of developing a number of diseases. Some can be serious, such as diabetes, kidney disease, and high blood pressure, and these diseases can lead to a shorter life span. It may seem like a hassle to try and get your cat to lose weight, but it definitely pays off to have a healthier kitty in the long run. Free feeding is so convenient, but it is also gives you no control over how much your cat is eating. Limiting how much your cat eats is extremely important in helping your cat lose weight. Long gone are the days where your cat would have to hunt for their next meal, so the amount of food your cat eats should reflect that. Just like their human counterparts, many cats also eat when they are bored. We don’t blame them! But since they don’t have the self control to not eat that tasty kibble, it is our job as owners to help them by limiting their access. But don’t cut back too drastically! Crash diets are not good for cats, in fact, they can be deadly. If your cat does not eat enough for a couple of days, they are at risk of developing “fatty liver disease”, which can be fatal. Make sure you are feeding the amount recommended by the food manufacturer, or even better, the amount recommended by your vet. Of course, it is just as important to make sure you are not feeding your cat too much. 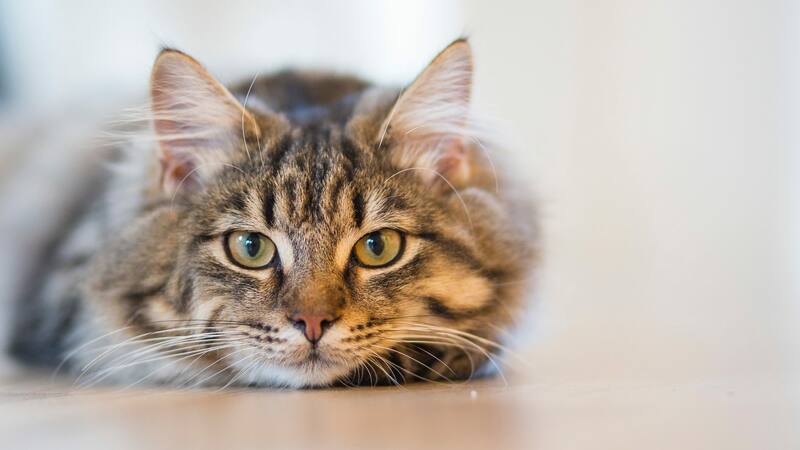 Even if you are not free-feeding, overfeeding your cat at designated meal times still has the same effect as free-feeding - they are still eating more than they need. If you have multiple cats, this might mean separating them at meal times to ensure they eat the right amount. Make them work for it! If you’re reading this article, your cat probably loves food. Which means food is a great motivator to get them to move around! One way to get your cat to move more is to place their frequently used items in different areas around the house. Even placing their food bowl further away from their favourite sleeping spot makes them walk more throughout the day. Another “game” is to place your kitty’s food bowl in different area of the house every day, and making them “hunt” their food. There are also options for cat toys that make your cat play to get the food or treats inside. If all else fails, taking a lap around the room before feeding your kitty is better than nothing. It’s easy to forget that the little treats that you give your cat throughout the day are actually treats and have calories. They look just like kibble to us, but they are your cat’s equivalent of cookies and chips. Remember, your cat is a lot smaller than you are, and what looks like a small portion to you may be a fair amount of treats for your kitty! It is important to find a way to get your cat moving! This is where meowbox can help! Sometimes, it does take a little bit of effort. Not every cat likes to play on their own. Some cats want a toy that actually moves, and some just want their owners involved for some attention and bonding time. Try to take time out of your day to play with your cat. You can start small to pique their interest in playing - even just wiggling a toy in front of them when they are lying around should get a few half-hearted bats. Although getting your cat to run or jump is obviously better exercise, even getting them to bat at a toy for a couple of minutes is better than nothing. And super adorable to watch! So you just fed your cat. Twenty minutes later you know they’re not hungry but they’re getting under your feet and yowling their “feed me!” meow. One of the most difficult parts of getting your cat to lose weight is dealing with how annoying they can be! If your cat is a beggar, firstly, make sure they are not hungry due to any health or diet related issues. Once you have confirmed your cat is healthy and has a sufficient diet, well congrats, you just have an annoying kitty on your hands! When dealing with a begging cat, it is important make sure you do not reward begging behavior. 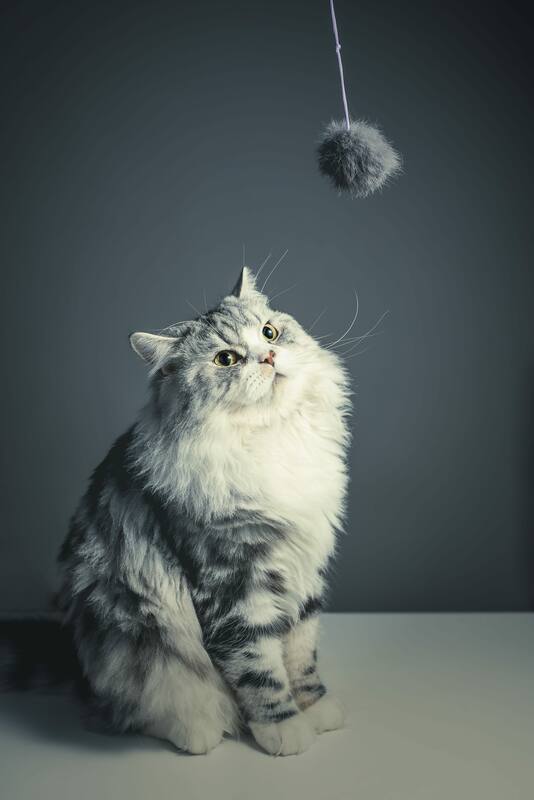 If you give your cat a snack or a treat every time they start meowing, they will associate their yowling with getting food. As difficult as it can be, just don’t react - do not positively or negatively reward their begging. They will soon learn that their begging gets them nowhere - no food or attention! Lastly, when you are feeding them at their meal time, make sure to give them lots of positive reinforcement so they associate their scheduled meal time with positive attention. 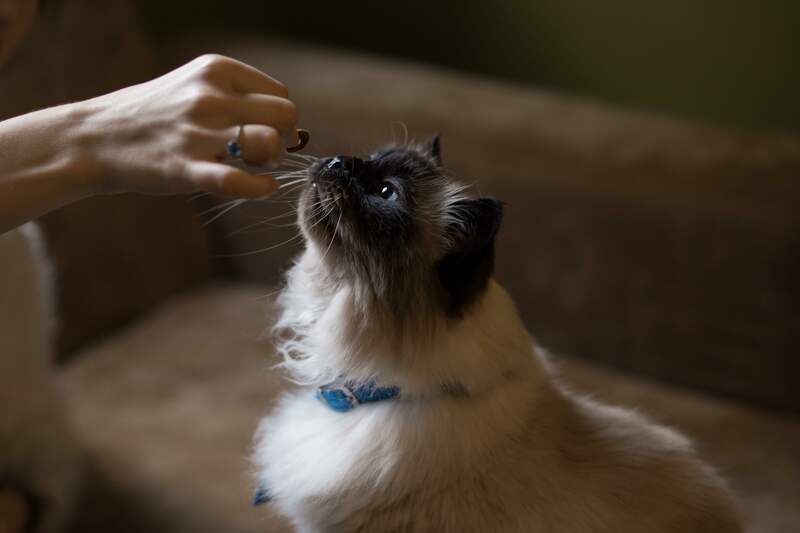 Although your cat may not be ecstatic about their new diet and exercise regimen or lack of treats, it is well worth it for your cat’s health - and it gives both of you an excuse to have more bonding and play time! Your vet is the first person you should consult to figure out if your cat is overweight, and to make sure your cat loses weight in a healthy way. If your cat is overweight or obese, they are at a higher risk for a range of diseases. 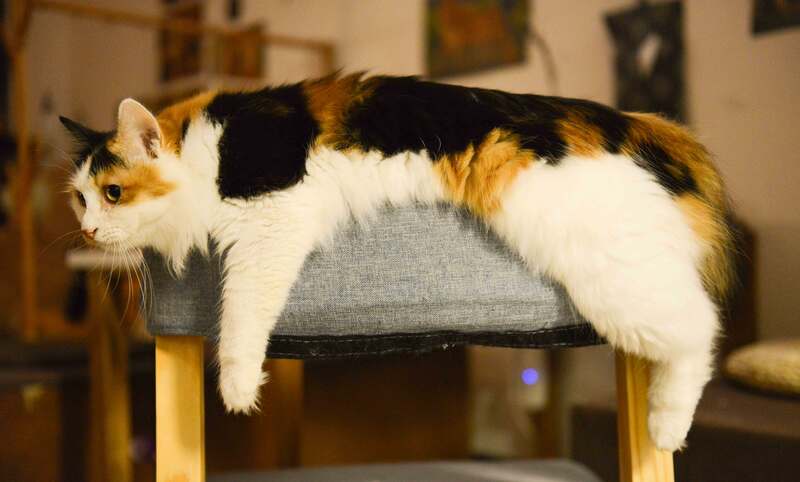 Helping your cat lose weight definitely takes some patience and effort, but it is worth it for your kitty’s health in the long run! Did that article entertain you? We think meowbox would entertain your cat. Sign up for meowbox news, discounts & more! © 2013-2019 meowbox Inc. All rights reserved. "meowbox" is a registered trademark of Olivia Canlas.